Brittany and Shawn had their first visit to Dubai this year. 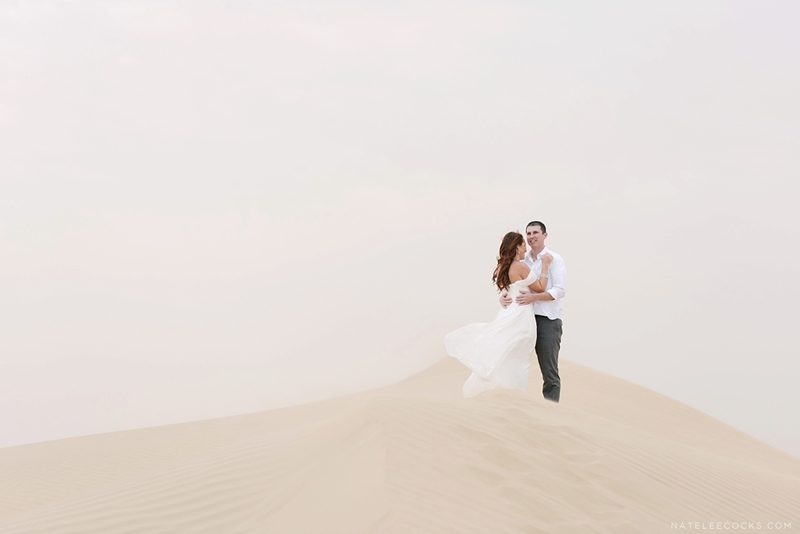 Originally from Cleveland, this couple decided to capture their memories in a Desert Romance Photo session. I met Brittany through Instagram and was very excited (and slightly nervous) to photograph this lovely couple. BRITTANY is an award winning photographer who specialises in newborn photography and turn gorgeous families and teeny tiny babies into an artwork. It is evident that she pours her heart, soul, time and talent into her photo sessions. For most photographers it is easier behind the lens, than being in front. Brittany, however, was a natural! Shawn was up for anything and had an infectious laugh throughout the shoot. It was a privilege to be part of this romantic shoot. 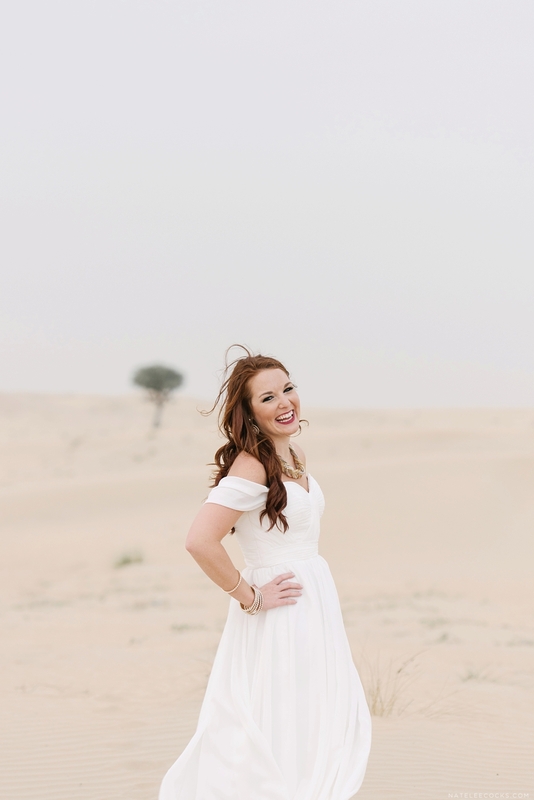 When planning a couple shoot in the Dubai desert, I tend to go to the same spot every time. Just outside of Dubai, Al Qudra is the perfect spot. It’s quiet and 30 minutes away from the Dubai Marina. Popular spots in the desert can be crowded or disruptive with adventure seekers going off-road. 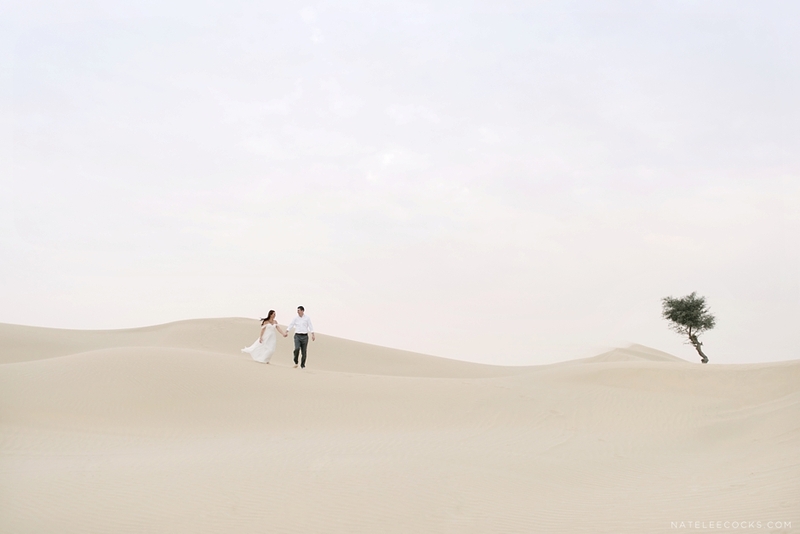 With one tree, two lovely people and endless grains of sand our stage was set for an unspoiled desert romance. Brittany’s dress was elegant, soft, flowing and just perfect! As the sun decided to hide behind the clouds, the sky transformed into a soft shade of purple. The light was impeccable and added just the right amount of romance to this shoot.